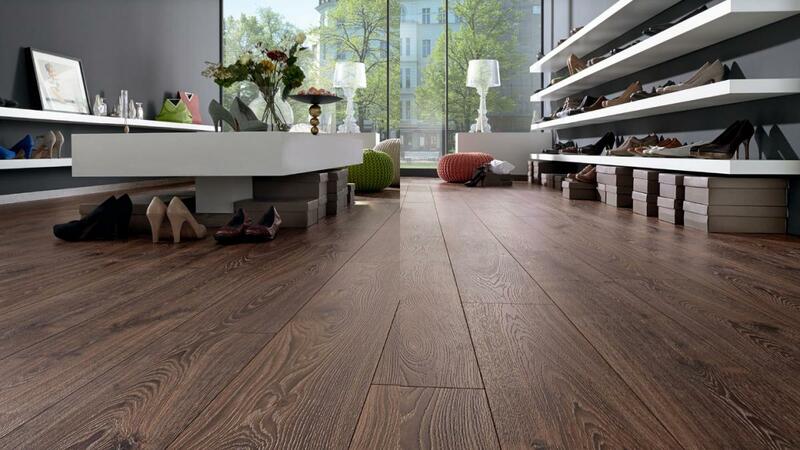 Stylish Flooring is not just for the domestic market. Comercial flooring can look just as good. Using textures and colour to create an abience. It can be used for breaking up larger areas into zones. If you want carpet, then carpet tiles are a good solution.The main reason is the ease of instalation. Instead of having to clear the whole area, you can clear a section at a time and move the furnitue over as you go. You can eaisly zone areas with different colours and customise the look with borders and strips. They can be lifted out individually and replaced if they get badly stained or damaged. Here is some good advice from Heckmondwike, one of the leading manufacturers of carpet tiles. Studies have proven that the design of an office can have a significant impact on the morale and motivation of employees, therefore getting the design and interior fittings and furnishings right is really important. Here, the experts from Heckmondwike FB bring you some recent trends that are making an impact in offices across the UK. Open plan offices have been around for over 40 years now, but in today’s offices, flexibility is key. Hot desking is a common trend, when people don’t have a designated seat or desk but move around from one place to another, as the business requires. Carpet is being used more widely for zoning an area, rather than using barriers or partitions. This means that employees can move around more freely and feel less confined within compartments, creating better collaboration. Bold colours can be integrated within classic backgrounds, for example Broadrib within Array, creating a stunning complementary look in the workplace. We’ve all heard how sitting down at our desks for hours on end, without walking around or standing up, can be bad for us. Health advisors are now recommending new ways to keep fit and active whilst being at work and are encouraging office workers to increase the amount of standing they do throughout the working day. 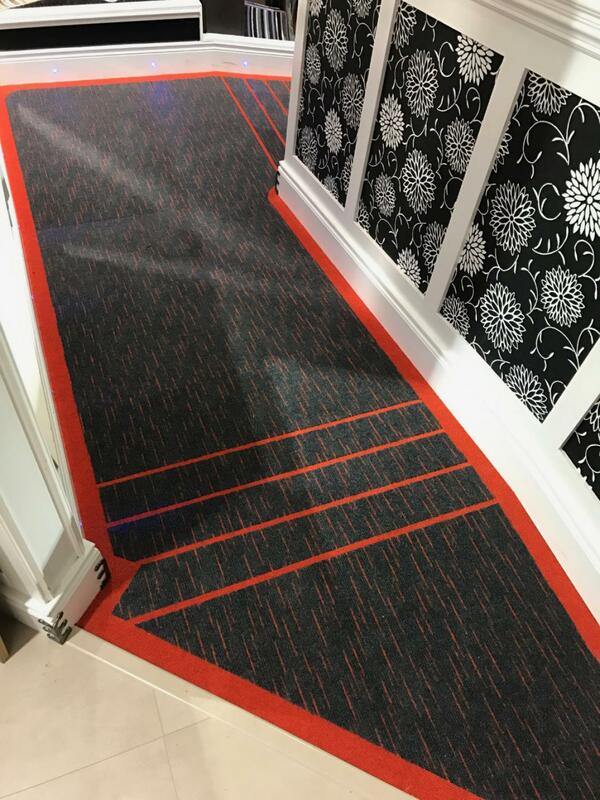 Office designers have taken this into account by selecting carpet that is comfortable underfoot to stand on for long periods and is particularly durable. 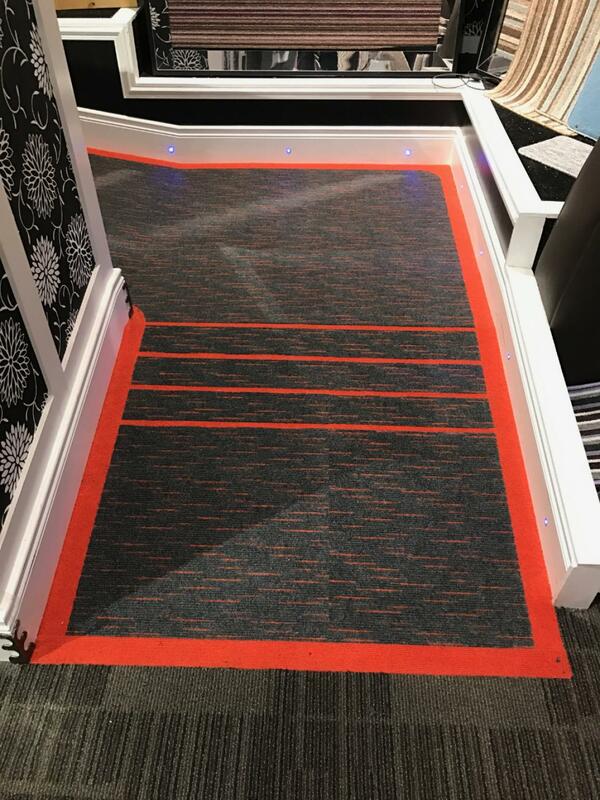 Supacord is a great choice of carpet for the office environment as it can withstand heavy foot traffic, offering high performance over the long term. It’s also a non-slip flooring option. Another popular trend that has emerged this year is making the workplace feel like home. Studies in the US have recognised a move away from traditional ‘clinical’ office design to a more residential feel. This has led to choosing natural materials, colours and tones that reflect nature. Soft earthy colours have become more widely used too, particularly in carpets with greens, reds and browns rising in popularity. In addition, as companies and employees become more environmentally aware, elements of nature are being introduced into the office environment. Research from the World Green Building Council suggests that humans have an instinctive bond with nature and there is a growing scientific understanding that the use of green space and nature-related designs in a work environment can have a positive impact on mental health, reducing stress and increasing focus. Blue and green tones of carpet can be used to achieve this by creating a calming and peaceful environment, promoting wellbeing. 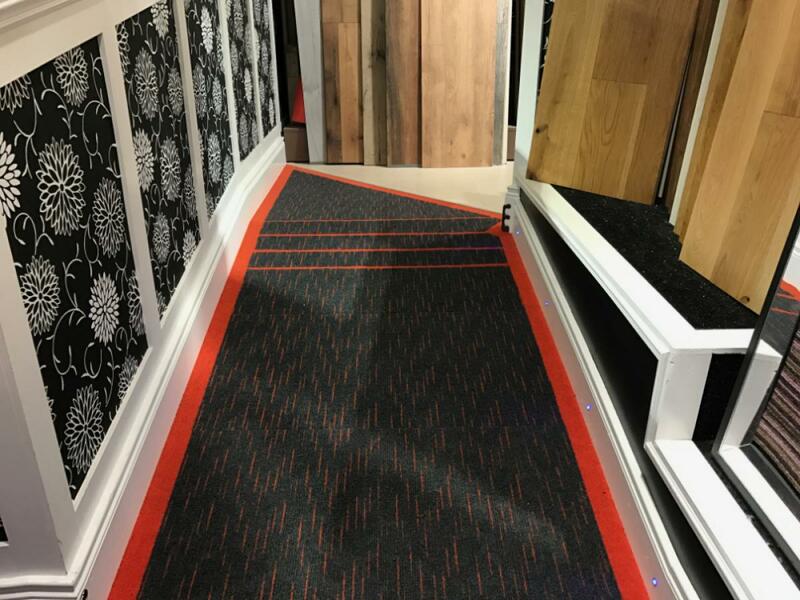 By incorporating our creative carpet designs into a project, carpets for offices and businesses can become more colourful and stimulating for employees and visitors. Check out Array, Night Sky, Montage and Constellation. Many organisations these days design in breakout areas, particularly where their offices are open plan. This has been found to improve creativity, collaboration and overall productivity. Breakout spaces, by definition, are where workers choose to move away from their desks to work, for example for quiet working or to stimulate creativity. Encouraging staff to leave their desks and spend some time away from a computer screen can help to promote employee wellbeing and improved posture while it can also relieve stress. 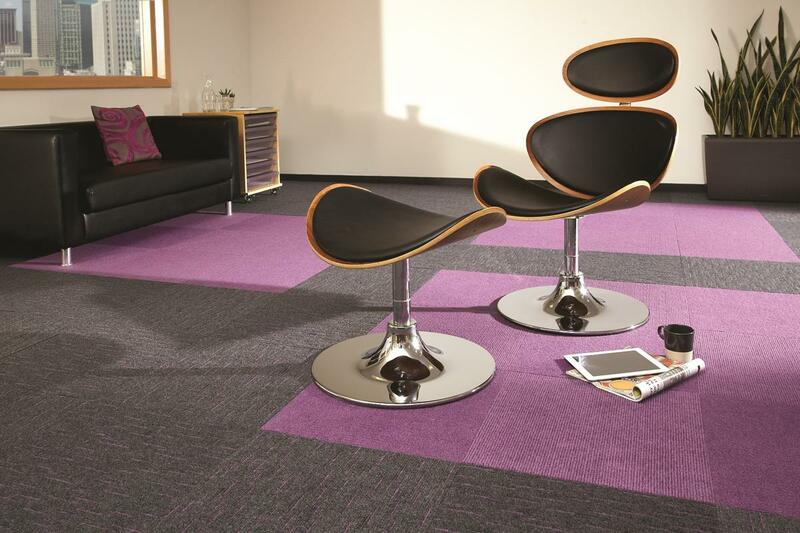 Often these breakout spaces are identified by inspirational design of carpets and wall coverings. Available in 9 colours, Night Sky offers a great choice that provides a more contemporary twist for designers who are creating office breakout areas. As more of us work in offices with open plan spaces and several floor levels, the need for flooring that offers sound deadening properties is really important. Research has shown that open plan offices, without sound deadening flooring can lead to increased stress levels due to constant noise. 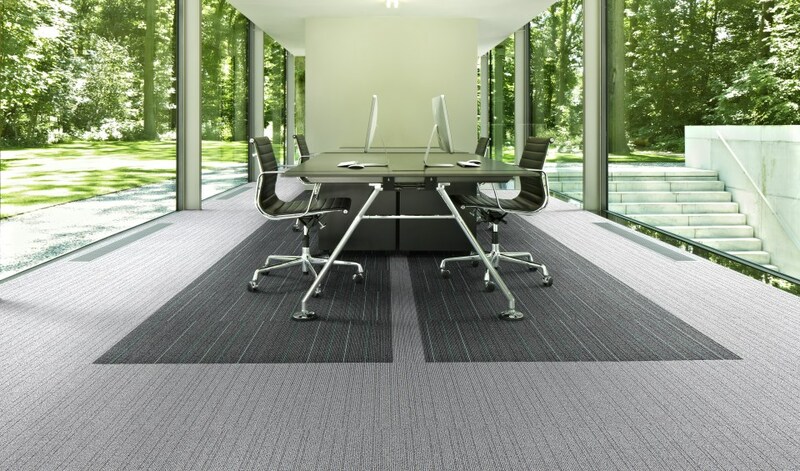 As a result, there is a resurgence in the use of carpets rather than hard floorcoverings for office environments. 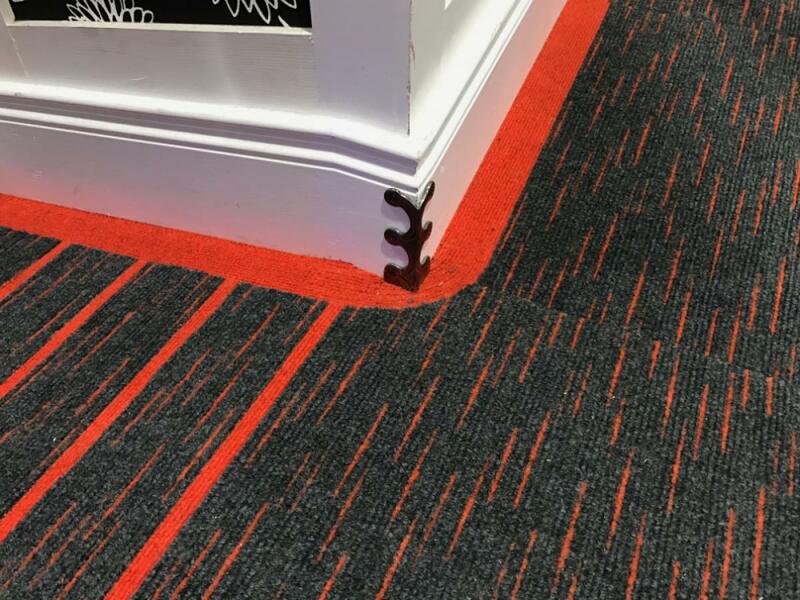 Carpet is emerging as an effective soundproofing material and Montage carpet tiles are a good way of reducing noise in an office. 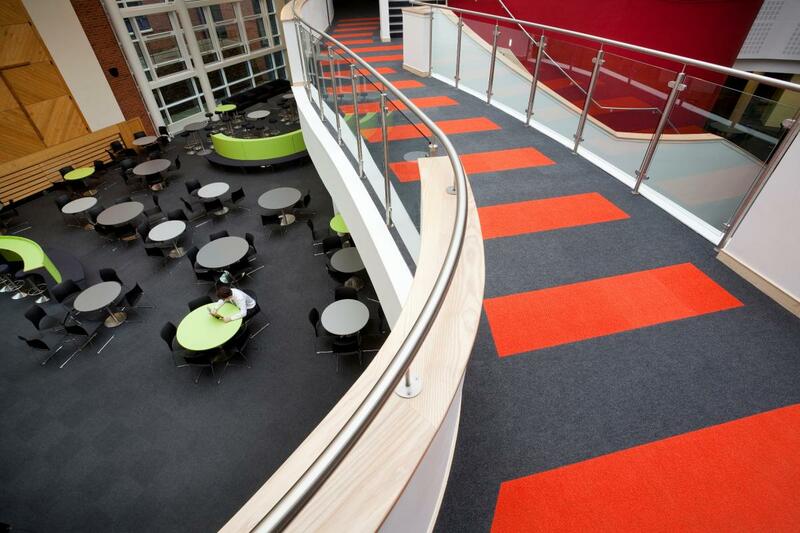 Montage carpet is great at absorbing sound and impact noise can be reduced by up to 30dB. We also have 4mt wide contract carpet if you prefer. No fraying at the joins. Full stick down. 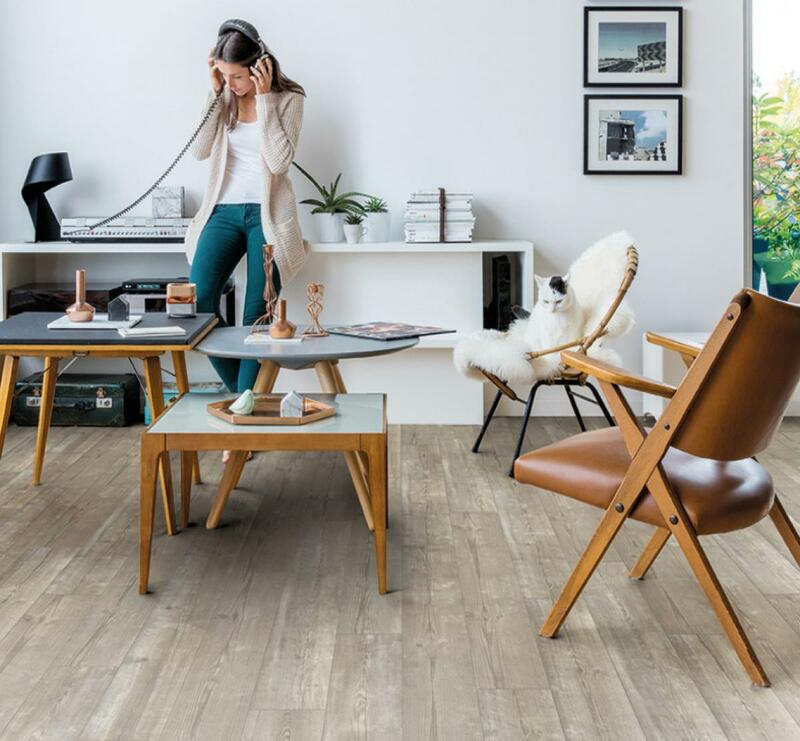 If you are looking for vinyl, then an easy solution is click vinyl, with all the same advantages as carpet tiles for fitting in that you don't have to clear the whole area. The sub-floor does not have to be perfect as it would be for glue down vinyl and you can put it on top of ceramic tiles as long as the are level. 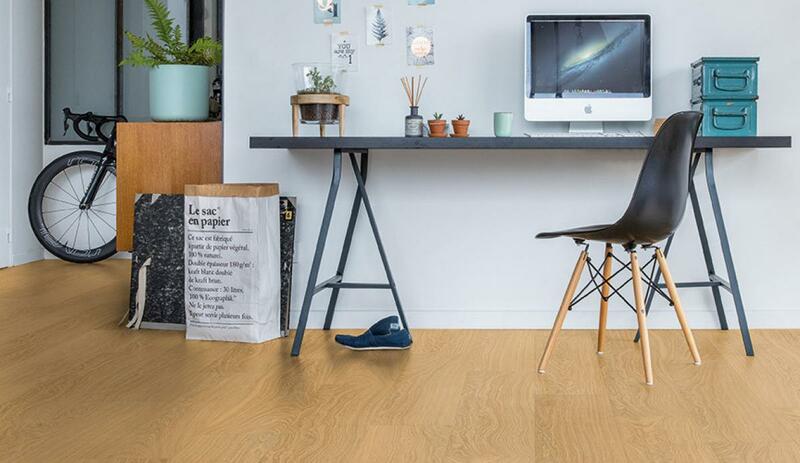 The Quick Step range called "Livyn" has a scratch guard and stain guard with a contract quality available. 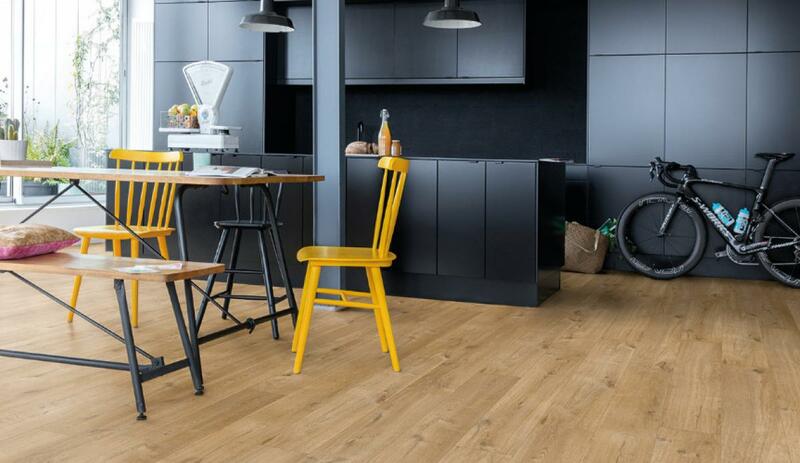 For laminate, our favorite has to be the Krono range of 12mm and 14mm AC5. Raised textured surface makes this flooring very realistic looking but more durable then real wood. Long planks make for faster instalation and look good in large areas.